I'd heard there was going to be a full page ad regarding the FDA and the Artificial Pancreas (AP), so I was super-excited to see it. So I clicked the link. Woah. I was stopped in my tracks. I sat there staring at the ad for several minutes, trying to process it all. My initial reaction was something along the lines of, "Holy effing shiitake mushrooms!" Followed soon behind by, "That's so badass!" I don't think I was the only one shocked by the ad, and I know there's a lot of varying opinions on the decision to run such an ad. For what it's worth, here's my two cents. I freaking LOVE this ad! So. Much. Yes, the 1 in 20 statistic is quite scary*. Every time I look at the ad, my stomach sinks. Lows scare the living daylight out of me. But I still love this. I have never seen anything from JDRF be so blunt and aggressive in it's approach. This ad is not aimed at those of us living day to day with type 1 diabetes, or caring for a loved one with T1 diabetes. It's aimed at the general population. At people who have no idea what it's like to live with T1. That's it's a serious disease. That it's 24/7/365 without a single break. Ever. That people are DYING from this disease. We see the blue candles and live with the fear. They don't. This is not the time or place for delicacy. For being worried about offending people. For, forgive the pun, sugar-coating anything. I can only hope and pray that this ad has made some people think. Has changed some hearts and minds. 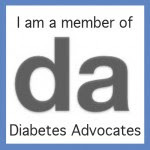 Inspired someone to find out more about T1 diabetes, or any kind of diabetes. I don't place much stock in a cure. I honestly don't believe I'll see one in my lifetime. That's why I am so passionate about the AP. That's where I place my hope. It's ok if you don't agree with me. But we NEED the AP as soon as possible. LIVES are at stake! Edit to add: I came across this heartbreakingly honest post regarding the ad from Jessica Apple on A Sweet Life today. You NEED to go read it. 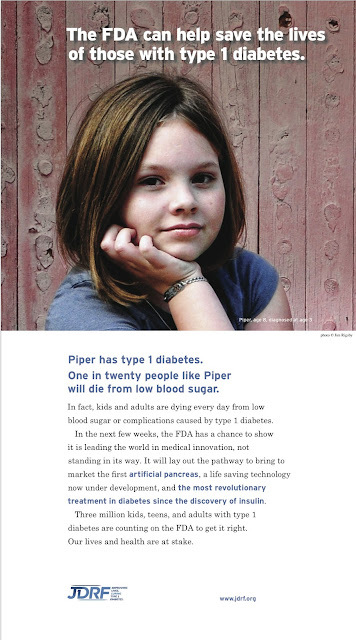 *I contacted JDRF, and they said the statistic in the ad comes from "Several publications by Philip E. Cryer, MD on hypoglycemiacite estimates of death due to hypoglycemia in patients w/T1D, et al." They also said to email info@jdrf.org for more information. I do think it is bold and like what they are trying to do. As a PoCWD I don’t like reading the statistic and it certainly won’t help me sleep any better but it is what it is. I hope it has enlightened some to the reality of our constant fear. Thank you for sharing your thoughts on all of this. yeah dude, i am so with you. i hope it makes people more aware of how important this technology is. Me too. I love it! Very badass. It's time for badass! I'm writing a post now... and I'm gonna link you up! Another stat I've heard from Aaron K is that a person with an A1C under 7% (the recommendation for most people) spends on average 4 hours a day in a state of hypoglycemia. I've worked very hard to make sure that my daily hypos are at a level I can personally treat, with very little disruption to my day. But I can never rest easy, nor can any of the people and families who live with type 1 day in, day out. To each other, we can agree "we can do this"--gotta have hope, right? To the rest of the world, it only helps when we are blunt and real. The people who are up in arms about it need to understand, just because it's not talked about, doesn't make it any less true. I know a lot of people have taken issue with the fact that the numbers are not correct, but in my opinion, even ONE person loosing their life to a low is too many. Just ask the mom who had to bury her daughter. Let's hope the FDA takes notice.